The Rising of the Divine Feminine Video Series exploring the nature of the divine feminine as a powerful energy igniting the sacred fires of transformation. 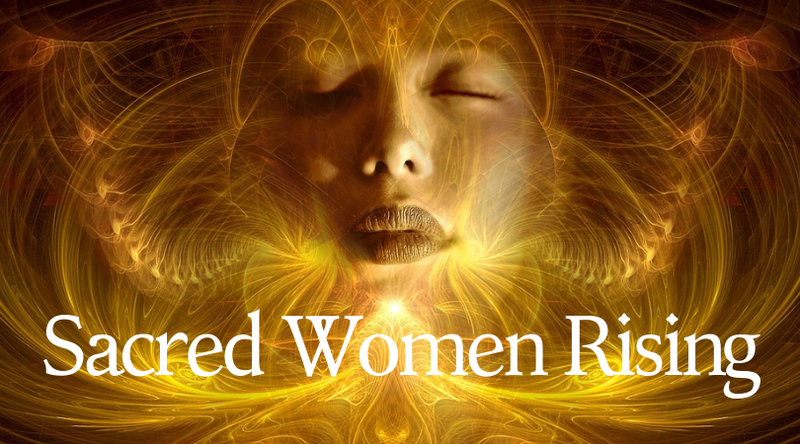 Sacred Women Rising Storytelling projects to be birthed in the near future where women will share their empowering transformative stories of Arising from Silent Crimes: Tides of Compassion, Interviews with our Mothers, Divine Feminine Transformation and more! The divine feminine is the ineffable essence of fierce grace, compassionate strength, and wise truth. The primordial heart of darkness from which all things are birthed, transition into death, and are reborn again. The divine feminine is both the eternal web of the grandmothers weaving life into existence and the space between the threads of life. The cyclical womb of creation. The divine feminine lives within each of us, no matter our gender or transgender. Within our bodies as the left side of the body and the right side of the brain. When we engage the divine feminine aspects of ourselves, we treat our bodies as temples to be honored. We develop a relationship with our bodies as vessels of divine creation rather than shells to be discarded to ascend to the afterlife. In doing so, we develop a relationship with the earth as a sanctuary to be honored. The Way of the Divine Feminine acknowledges all aspects of the rhythms and cycles of life in relationship to one another. Each atom and subatomic particle is in relationship to one another including the space within it and around it. Each particle creates the minerals, plants, animals, humanity, and elements of air, water, earth, fire, and ether. Take a moment and contemplate this relational view. Noticing how your life touches the lives of others including the lives of the plants you eat, the earth you walk upon, the children you raise and teach, the lovers and beloveds in your life, and all of the systems on earth including the natural systems and human made systems. All things are in relationship to everything everywhere, always in all ways. This means we are interconnected and interdependent with the earth, her creatures, minerals, plants, animals, elements, and all of humanity. We all have red blood flowing through our veins. How we are in relationship with ourselves, our families, our earth is what creates our lives to be the way they are. The Way of the Divine Feminine connects the mind through the heart. The intuitive capacities of creation. The Knowing of life’s rhythms, sacredness, and possibilities. The “passive” surrendering principle of creative flow. The nurturing container of sacred silence. The Way of the Divine Feminine connects our personal, community, and global relationships through the enveloping arms of compassionate strength. True compassion requires strength because it calls upon us to be able to sit with the excruciating pain of another person and fully relate to their suffering by acknowledging it within our hearts and souls. Being compassionate is not about self-pity. Being compassionate is about sitting in the fire of the hate/abuse/pain of someone’s actions against us or against others, and feeling the heartbreak of our “enemy’s” pain. To then acknowledge their pain and suffering, and continue to connect with the love within our humanity. The Way of the Divine Feminine connects with the warrior’s wise truth of fierce grace. How can the divine feminine be both love and truth? The paradox of life’s mysteries is also the divine feminine. For to be the container of life, death, and rebirth, the divine feminine allows for suffering and joy simultaneously. The Way of the Divine Feminine connects us with Sacredness on earth all around us and within us vibrating and resonating to our heartbeats. The air we breathe with the trees is sacred. The water within our bodies is the sacred water of the rivers and streams. The minerals in earth are sacred within the soil nourishing us as we eat vegetables and fruits. The fire within the hearth is sacred as it is the same eternal flame within our souls igniting the truth of who we are. When we follow the divine feminine as a Way, we begin to truly allow the divine feminine to open up within ourselves, our lives, our family, our communities, and in our systems. We surrender to the divine feminine way moving through us, and allowing possibilities of nurturing and caring for our lives with reverence. In doing so, we walk with reverence for our earth. Because, our earth is the divine feminine in grand form. Our earth is our mother. Our earth grants us life. We honor our bodies as temples in relationship with how we treat our sensuality and sexuality in a sacred way, how we treat our physical health with a desire for wholeness, and how we treat our intimate partnerships by only inviting in those who respect and honor us. First, we must respect and honor ourselves. We honor our divine intuitive knowing in bringing forth creative insights into our lives, places of work, our families, our communities, and our intimate partnerships. We honor our spiritual guidance in bringing forth rhythm and flow into our lives, places of work, our families, our communities, and our intimate partnerships. We honor the moon and her cycles by acknowledging how the moon’s energy and phases connect with our menstruation cycles and with our lives on a deep yet often subtle way. We honor our children as wisdom keepers and teachers of the new age. As mothers we listen to our children, no matter what age they may be, for we know deep within ourselves that our children carry soul messages and teachings to help guide us as parents, help humanity’s relationship with one another and with the earth during this transformational time. We honor our ancestors whose blood flows in our bones and have given us life. Our mother’s lineage especially is important as women connecting with our inner creative power, and with our father’s lineage connecting with our soul’s purpose. The bones of our ancestors are buried in the earth, and inform us in the dreamtime. By awakening to our dreamtime, we awaken to the wisdom messages of our ancestors as well as their connection to the earth and star beings. We honor the mystery of the unknown from which vast experiences of the primordial mother’s void grants us silent spaciousness to allow mystical spiritual experiences to be our continual life’s experiences toward enlightening ourselves and humanity. We honor and forgive our mothers. So many of us, especially women, have been very challenged by the feelings and experiences of abandonment, neglect, dysfunction, and traumas of all sorts occurring in our lives from their mothers. Even so, our mothers birthed us on earth. They carried us in their wombs to bring us into form. They did the best they could with what they were given. We are to forgive and accept all of the transgressions. It is time. For when we forgive, truly forgive through absolute compassionate acceptance, then our relationships with ourselves, our beloved partners, our children, our parents/guardians, and the earth change toward thriving fulfilling health and wholeness. Check out the blog: What is the Divine Feminine? for more information about the divine feminine and specific practices to connect with the divine feminine. The following divine feminine principles have been given to me over the past three years during my New Year’s Day meditations. These principles are also sacred practices. By integrating all three principles in your life, you are rooted in your being to be able to be fully connected to your divine knowing so you can develop creative prosperity to create sovereign choices, creative projects, sacred relationships, and holistic systems. By Establishing the Root of Being you become deeply connected to your authentic soul expression. When the connection with your soul is rooted within you as a way of being, then this allows for your heart and soul to Rest in Knowing. By Resting in Knowing, you create a sacred connection with your intuition toward illuminating your next best steps from a soulful place. While Resting in Knowing, creativity arises in a prosperous way. Creative Prosperity becomes the rhythmic flow and wellspring from which arises the totality of your soulful creative power! Which grants you accessibility to create beautiful sacred works of art, writing, speeches, or anything else you wish to create! Being a Goddess means we as women have the opportunity to embody our unique soul expressions connected with the all encompassing Divine Feminine Source of the earth and the universe. By being a goddess, you are uplifting the unconscious archetypal energies of our human culture to bring forth the conscious divine feminine source into manifest form. How we do this requires impeccability of thoughts, words, and actions as well as responsible reverence for all sentient beings (mineral, plant, animal, human, earth, star beings, and cosmic energies). As goddesses, we have deep reverence for the earth, her elements, and her creatures as well as a noble heart connection with being a bridge between the earth and the cosmos. Playing a role and “acting” like a goddess is different than accentuating the essence of your soul in connection with the eternal goddess of the divine feminine within all life. It’s important to know the difference of “trying on” the beauty of a goddess versus fully coming into a greater appreciation and acknowledgement of the archetype of your unique goddess within. The goddess as your highest wisest truest self. The shadow aspects of our egos enjoy grasping onto being a goddess as a desire to control or manipulate people and spiritual energies with the intent to gain for our own benefit. These acts create negative harmful karma and serious adverse consequences. These are the subtle and not so subtle ways the ego expresses shadow dark aspects and tries to convince us of “doing like a goddess” instead of Being as a Goddess. When we are Being as a Goddess, we are aligned with the deep spiritual essence of the divine feminine way. The focus in the Way of the Divine Feminine and the Labyrinth of Illumination Program is to transform the core shadow aspects and defenses within the body, mind, heart, and soul toward creating a deep authentic soul connection to the goddess divine source within as well as a deep connection to the universal primordial great mother of the earth and the cosmos. In this way, a woman becomes a goddess by walking the Labyrinth of Illumination Program to ignite her authentic soul expression as an archetypal divine presence in the world and as a channel of the divine source so she can illuminate the way of her sacred service as well as illuminate other women to be of sacred service. The women who are awakening to the Light, Love, and Truth of who they are as divine feminine goddesses are here to shift the entire paradigm of women's leadership in their relationships with each other, with men, and with the earth at this time. To completely transform their own abuses (physical, emotional, mental, and sexual abuses on a soul level) so they can ignite the fierce grace, compassionate strength, and wise truth within other women to step into their light, love, and truth. These women who are brave, compassionate, fiercely graceful, and honestly wise priestess warriors are the Goddesses who are fully capable of ushering in the next 2000+ years of peace and harmony on earth. If you are one of these women, I'm so grateful for your presence, participation, and prowess. If you are one of these women, and you desire to fully step into your light, love, and truth of who you are knowing you need guidance to do so, schedule a Discovery Call. Let's talk about the divine feminine transformation initiation that will uplevel you toward Being a unique Priestess Warrior Goddess of Love & Light to be of sacred service in the world. I've been waiting for you. The Primordial Mother has been waiting for you. The Divine Feminine Source has been waiting for you. The Christic Divine Force has been waiting for you. We women have been waiting for you. Join a global community of women transforming their lives toward becoming authentic sacred women leaders. Over 2000+ years, we’ve experienced a huge imbalance in the way the feminine has been persecuted, twisted, abused, and violated in the world. There hasn’t been much support for us as women to allow the power of the divine feminine to come into fruition. Now is the time for Sacred Women Rising to transform women’s fears and self-hatred in connection with persecution. To shift the way women have been treated as well as how they’ve negatively treated themselves. To empower women to become sacred leaders of their lives. Sacred Women Rising is a growing community of women in a private Facebook group. The free training group empowers and guides women to connect with their authentic soul expression, gifts, and purpose through compassionate strength, fierce grace, and transformative empowering ways of being. Instead of living in victim consciousness feeling they are being over powered, women build a greater relationship with their own power to live a fulfilling life. Inspire authentic exploration. Exploring who we are, and the profound positive fulfilling changes we are here to create on earth. Empower us to authentically express our truths. Especially during times of conflict as we revolutionize our lives, relationships, communities, and systems. Transform our core defenses keeping us from knowing the authentic truth of who we are. So we can take soulful action to revitalize the world toward wholeness. If you hear the ancient mother, the great mother, the goddesses, and the feminine ascended masters calling you to serve the earth and humanity at this time, may you be guided to follow that call. Let's work together to rise the sacred within our souls, families, work places, and communities. Check out the following videos, facebook group, and services to begin our work together to bring forth the next level of leadership of sacred women rising. In this video, I share my personal story: From Powerlessness to Empowerment. Sharing how the divine feminine transformed my life especially in the forms of the Great Mother, the Goddess of Illumination, the Goddess Tara, Quan Yin - the Goddess of Compassion, and the Diamond Heart Christ essence of Mary Magdalene. The video also offers a meditation connecting with the divine feminine, along with answering the question: What is the divine feminine. The Rising of the Divine Feminine Videos explore the nature of the divine feminine as a powerful energy igniting the sacred fires of transformation. The videos showcase my personal wisdom about the sacred feminine along with empowered answers to difficult questions about women's issues as well as interviews with spiritual women leaders deeply connected to the wisdom of the divine feminine. To sign up to receive upcoming videos, click here. The following videos were created January 2018 - March 7, 2018 about the rising of the divine feminine on earth. May these videos support your spiritual journey. I'd love to hear how any of the videos landed for you, so please email me or leave a comment at the end of the video or send me a message. Thank you. If the videos in The Rising of the Divine Feminine Video Series have added value to your life, consider owning them to watch again and again! To purchase all 8 downloadable videos, click the link. Your financial support helps to rise the awareness of sacred women rising leadership in the world. The Goddess of Illumination alights the shadows and depths of pain, transporting them into conscious awareness through fierce and compassionate presence as a way to transform suffering into empowered wisdom, love, and light — our true nature. This painting was created during five years of guidance from Mary Magdalene. At the time, I wasn't aware of the labyrinth work I would be bringing into the world. Ha! I continue to feel blessed in deep gratitude for her guidance. In her majesty, and wisdom, the divine feminine continues to guide me on the next best steps of spiritual service. May the divine feminine rise up in all of us to bring forth healing and wisdom of living in relationship with Mother Earth and humanity in love, truth, beauty, trust, harmony, and peace. Limited Edition Prints of the Goddess of Illumination are for sale. In this small group program, participants develop a deep connection with the Divine Feminine Crystalline Christ essence through the guidance of myself, The Queen of Illumination, and the divine feminine transmissions of Mary Magdalene. The Three Part initiation process aligns you with your universal personal Tree of Life as a way to learn how to bring the profound energy of the Feminine Christ through your work in the world as the master of your unique gifts. The Magdalene Diamond Heart Initiation leads participants through their personal Abyss of Fear by mining the gold of their unique gifts in the "roots" of their tree. Then we work together to illuminate the "trunk" of their essence as divine feminine goddesses, and lastly we shift into higher states of consciousness with poignant lessons to spread the light of love, truth, beauty, trust, harmony, and peace into the branches of each woman's personal tree of life connecting them from heaven to earth and back again to be of GREAT service in the world and beyond. Because the nature of this initiation process moves into the deepest aspects of your soul, it is for those who have already accomplished and graduated from the potent initiation of the Labyrinth of Illumination. To learn about my personal mystical activation with Mary Magdalene, click to read the article: The Rising of the Divine Feminine. For a greater understanding of the Christic essence, I invite you to experience the Cosmic Attunement Podcast. It is an excellent way to expand your awareness of the Cosmic Christic energy. Take a moment and gaze softly at the center of this image. Notice the rainbow light spinning and vibrating throughout all time and space, swirling and whirling divine intention at the frequencies of light and sound. When we come together in a group with specific divine intentions connected with the crystalline matrix within our bodies while also attuning to the crystals within the planet, profound positive change occurs within our families, communities, and the earth. For we vibrate together as One, to the resonance of the crystalline matrix. Rebirthing humanity toward love, truth, beauty, trust, harmony, and peace. If you're being called to attune your crystalline body in a group of like-hearted people, let's connect and create together! The time is Now. Women’s voices have been silenced, hidden, dismissed, and unheard from many cultures for far too long. Women have experienced “Silent Crimes” within their very homes as children, wives, and mothers. These crimes have kept them feeling small, undervalued, oppressed, and victimized. Even so, these same women have transformed these very crimes into compassionate empowering ways of being. Their stories must be told! Our mother’s stories are being lost in the shuffle of the rapid changing times. Our mothers have experienced intense times of change, witnessed horrific wars, and birthed children in nations of turmoil. All the while doing the best they could with the darkness within them and around them toward raising their children. Their stories must be told! Women have experienced profound mystical connections with the divine feminine as Goddess, as Christ, as Sophia, as the Great Primordial Mother and more! The divine feminine transformations women experience will shift the way humanity relates to their girlfriends, sisters, daughter, mothers, grandmothers, and with the earth. Their stories must be told! This storytelling project came to me after watching a spiritual social justice online conference created by Sounds True entitled: Waking Up in the World. The Sacred Women Rising project will come to fruition when I am guided by the Primordial Mother to do so. I will be interviewing selected women to tell their stories of “Arising from Silent Crimes” toward incredible feats of strength, courage, and compassion. I will be interviewing mothers of the pivotal generation of women born from 1940 - 1960. I will be interviewing women who have had divine feminine transformations in their lives to share their mystical stories. If you’ve gotten this far to read about this storytelling project, and you are intrigued to learn more: whether you have a story to tell, your mother’s story to tell, or you are a publisher, please reach out to me. Thank you!